Photoshop? Nein danke! Was hier zu sehen ist, existiert zwar nicht. Aber zu sehen ist es dennoch - genau so, what you see is what you get, unverfälscht durch Softwaretricks. 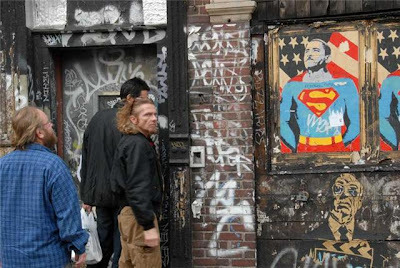 Der Schriftsteller und Fotograf Christoph Keller, St. Gallen und New York, stellt derzeit seine neuesten Fotografien aus, und zwar in der Galerie art101 in Williamsburg, Brooklyn, New York. Das St. Galler Tagblatt zeigt einige seiner Bilder und bietet dazu Kellers erhellenden Essay "Mit Licht schreiben", der zu den Bildern unbedingt zu empfehlen ist. Als Schriftsteller und Journalist ist Keller im deutschen Sprachraum eine feste Größe, er verfasst Romane, Erzählungen und Theaterstücke; daneben übersetzt er aus dem Russischen. Nun schickt sich Christoph an, mit der Übersetzung seines beeindruckenden Buchs "Der beste Tänzer" auch auf den US-Markt zu gehen. Ich drücke meine Daumen and cross my fingers for you! "New York is an ugly city, a dirty city. Its climate is a scandal, its politics are used to frighten children, its traffic is madness, its competition is murderous. 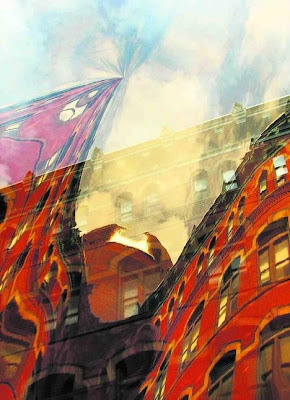 But once you have lived in New York and it has become your home no place else is good enough!" By the way: Here is my first photo book. Guess about what? 1.You say "the city" and expect everyone to know that this means Manhattan. 3.You can get into a four-hour argument about how to get from Columbus Circle to Battery Park at 3:30 on the Friday before a long weekend, but can't find Wisconsin on a map. 7.You've considered stabbing someone just for saying "The Big Apple". 9.You call an 8' x 10' plot of patchy grass a yard. 11.You think Central Park is "nature." 12.You see nothing odd about the speed of an auctioneer's speaking. 13.You're paying $1,200 for a studio the size of a walk-in closet and you think it’s a "steal." 14.You've been to New Jersey twice and got hopelessly lost both times. 16.You haven't seen more than twelve stars in the night sky since you went away to camp as a kid. 19.You haven't heard the sound of true absolute silence since the 80s, and when you did, it terrified you. 24.Going to Brooklyn is considered a "road trip." 26.You've gotten jaywalking down to an art form. 30.You have a minimum of five "worst cab ride ever" stories. 31.You don't notice sirens anymore. 34.You're suspicious of strangers who are actually nice to you. 40.You run when you see a flashing "Do Not Walk" sign at the intersection. 41.You're 35 years old and don't have a driver's license. 43.You're willing to take in strange people as roommates simply to help pay the rent. 46.When you're away from home, you miss "real" pizza and "real" bagels. 47.You know the differences between all the different Ray's Pizzas. 48.You're not in the least bit interested in going to Times Square on New Year's Eve. 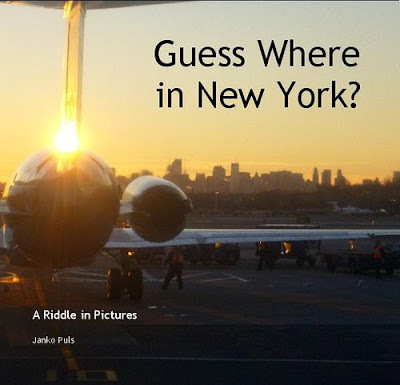 51.You know how to fold the New York Times in half, vertically, so that you can read it on the subway or bus without knocking off other passenger's hats. 55. People from other states cant tell a polar bear from a peanut, but they know you're from NY the second you open your mouth. 56. When you are able to make a right turn at a red light.. you think it's the best thing ever. 66. You cross the street on a greenlight, and if you get hit by a car you blame the driver for "not watching where they're going. Skepsis on election day's morning: Will he make it? The expectations are high - also on 2nd Ave on Houston. "With these pix [(c) Janko Puls] I hope you get a sense of the ecstasy we were experiencing in the wee hours of the morning after (no drugs, but perhaps a little wine was imbibed! ;-) - and we felt the rest of the world dancing with us. After Obama's acceptance speech, I was on my way to bed...but I could hear out our bedroom window people cheering, so Janko and I decided we had to check out the scene. 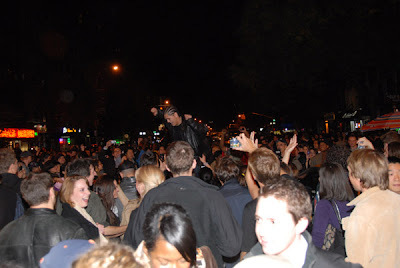 The East Village comes out to party! 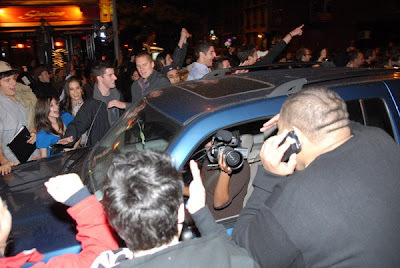 People were pouring into the streets to celebrate. 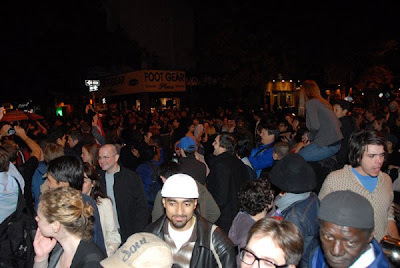 Almost everyone was smiling, hugging, shouting, jumping up and down, and generally rejoicing - and yes...dancing in the streets. 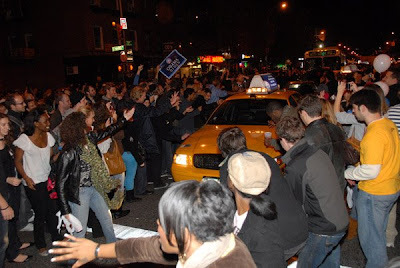 It seems they spontaneously started to congregate near the intersection shown here (First Avenue and St. Mark's Place, just around the corner from where we live). 1st Ave is shut down by a huge street party. 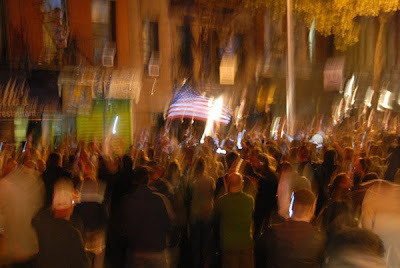 Slowly it became a crowd that swelled out into the avenue, taking over the intersection and stopping traffic, until the police gently corralled folks into St. Mark's, the smaller side street, and left them there to party, though with their presence on the sidelines (as we saw on our way home two hours later - the last albeit blurry photo). Make noise! Show your appreciation! Shout out your relief and excitement! It looks like it was a little hairy for the drivers, as the crowd really did slap on each car that managed to crawl through all who had descended, but everyone - including a poor older Indian cabbie who even had someone stick their hand in his window to rub his bald head - was smiling and shouting and honking / making noise along with the rest of us. You'll see one woman driver was even video taping *us* as she drove by! Self referential: Yes, we did it! 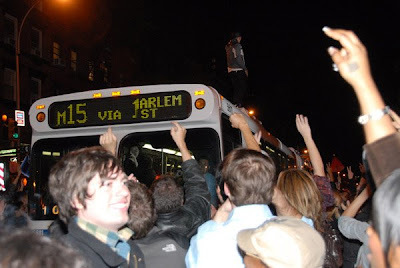 You can just make out there's someone on top of the bus, who, when it finally made it through after being blocked by this crowd - traffic was stopped for what must have been an hour - the driver had to be warned that he had an "unpaying passenger" atop, and to let him jump down before proceeding uptown. 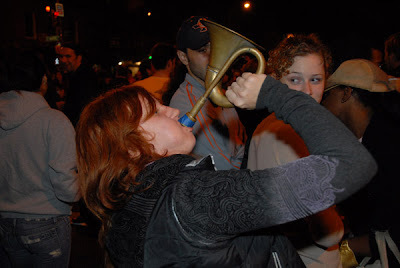 There were people banging pots and pans, bodhrans and drums, and this woman with her bugle. It was amazing - like a dream (come true! hurray!) - a really incredible, and immensely moving, experience to be a part of, and such a wonderful and fantastic piece of history to have participated in. World, can you hear us??? Here's to what finally promises to be a brighter, safer, more peaceful future. WE DID IT!" Isn' it remarkable, that parts of the battle about the next presidentship take place in a comedy show? Not only would the US system of selling a candidate on TV be unthinkable in Europe, this year's campaigns go to the extreme. Never was so much money spent on the campaign. Hardly ever so many Americans will probably cast their ballots, hardly ever this election is seen as a crossroads for America. And certainly never we had so much (involuntary) fun with the candidates. John McCain is still fighting, but certainly doesn't lack a self irony. After Sarah Palin he also stepped onto the stage in Saturday Night Live. Is this is a qualifying statement for president wannabes? You decide. On Tuesday. Anyway: Enjoy. 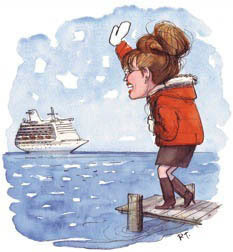 Well, Sarah Palin had a great start - as comic/tragic figure in comedy and on the internet. Just some days before the elections here some nice links. You don't have to be an enemy of Palin to enjoy the craze about her person - but you might turn into one. The VP candidate often gets lost in the linguistic welters like a flying dutchman. Read Palin's answers on the fully automated answer generator. Did you get what she said? Help Sarah Make Sense! Quite similar to "interview Palin" but this time with mp3 files in a meshup. Très funny. Listen to mixes or make your own. 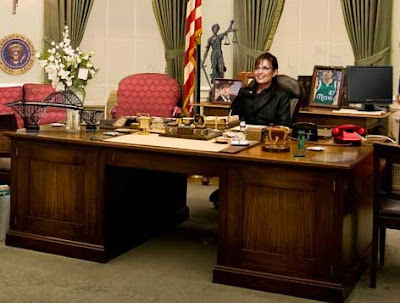 Often copied never topped: The Saturday Night Life Opening Skits with Tina Fey as Sarah Palin. Check them all out on the NBC/SNL video website. One of soo many satires on youtube.com - good starting point, just follow the links. Two serious links towards the end: Adam Brickley "invented" Sarah Palin as VP candidate with his blog palinforvp.blogspot.com/. Maverick, maverick, maverick, hahaha. More about the interesting backgrounds of Sarah Palin's quest for Washington you'll find in Jane Mayers article in the New Yorker The Insiders. How John McCain came to pick Sarah Palin.